Habitat Celebrates 31 years serving the community! 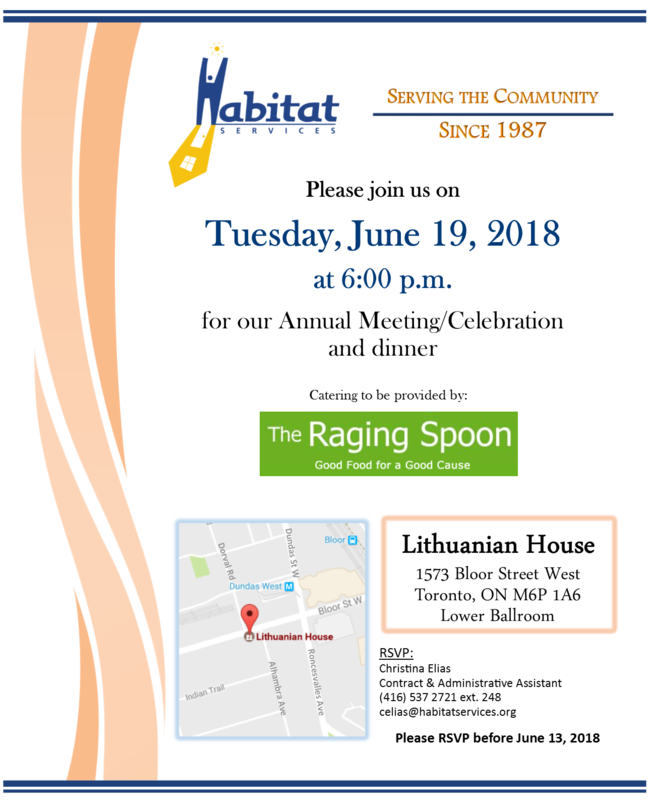 Next week, June 19th, 2018, we celebrate 31 years of Habitat Services. Join us for our Annual General Meeting & Dinner. RSVP to celias@habitatservices.org if you wish to attend. To read a copy of the 2017-18 Annual Report, click here! Habitat Services Waitlist is open! Habitat Services currently has a limited number of operating subsidies available and we are also developing a waitlist of housing providers interested in the Habitat program. To submit an expression of interest, complete the following survey. 2017 marks Habitat’s 30th Anniversary! We also celebrated one year of the FRESH program. To read a copy of the 2016-2017 Habitat Services Annual Report, click here. Habitat Services has been asked by the City of Toronto to assist with the provision of housing for the relocation of residents of the Seaton House shelter, which is currently slated to close for redevelopment at the end of 2019. Assessments of current Seaton House residents have suggested that up to 40% could live successfully in a community setting in a Board and Care environment. We are now able to formally request Expressions of Interest from providers willing to make available up to 150 units of permanent supportive housing with access to on-site supports by the end of 2019. Your provision of enhanced or specialized services, or those provided in partnership with agencies or other providers who can provide enhanced services, will be considered an asset. For example, these may include expertise in managed alcohol programs, HIV/AIDs, or culturally appropriate services for Indigenous or other client groups. The results of Habitat’s REOIs and resulting recommendations will form the basis of a report for funding made by City staff to City Council for operating funding in 2018 or 2019. In addition to per diem funding, start-up funding of $2,500 per unit for furniture and other improvements be available to successful applicants. The per diem in our existing program is currently set at just under $50, including tenant rent contributions. Some Housing Support will be available through Habitat Services using our existing site support model. Please submit a completed Expression of Interest form for each property you wish to propose, by October 31st, 2017. Show Toronto what is important to you! 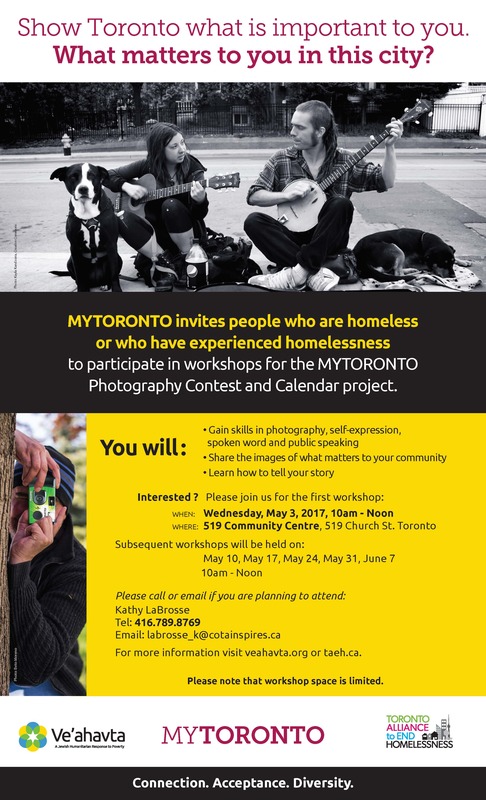 Habitat Services has been working with the MYTORONTO project to assist and facilitate engagement workshops for the upcoming MYTORONTO Photography & Calendar contest. The workshops cover photography, writing, public speaking, and much more! The last workshop will be held on Wednesday, June 7th, 2017 from 10 am to 12 noon. 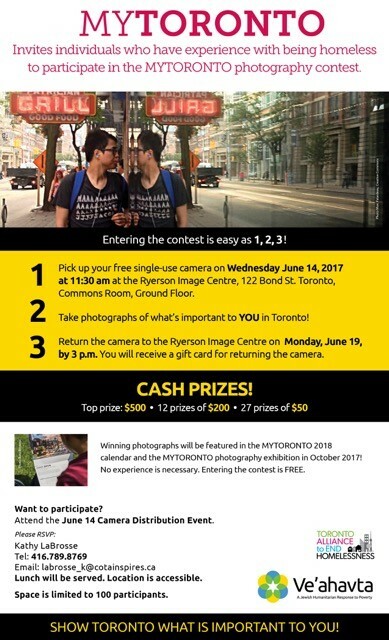 The MYTORONTO Contest Event will be held on Wednesday, June 14th, 2017 at the Ryerson School of Image Arts, 122 Bond Street, from 11:30am to 2pm! For those interested in becoming a MYTORONTO Calendar Vendor and make some extra money, join us for a Vendor Workshop on November 8th or November 15th, 9:15am, @ The 519 Community Centre! To register for the Vendor Workshop, please contact Kathy at 416.789.8769. 2015/16 was full of new experiences and initiatives for Habitat Services! We conducted a one year review of the self-contained units pilot, we partnered with the Gerstein Centre to expand their FRESH program to 4 Habitat-supported homes, and two members of the management team participated in a capacity building Learning Circle, led by InWithForward for 6 months. To read a copy of the Habitat Services 2015-16 annual report, click here. This year has been a busy one so far! In February 2015, Habitat partnered with Working For Change to provide a 12 week pre-employment program for 10 consumers/survivors/tenants looking to gain skills to work in the social service sector. In March 2015, Habitat launched a self-contained apartment pilot for current tenants living in Habitat funded homes wishing to move to a more independent and affordable housing option. To read a copy of the Habitat Services 2014-15 annual report, click here. Habitat Services focused on a tenant satisfaction consultation, owner consultation, and a menu project in 2013-14. To read a copy of Habitat’s 2013-14 annual report, click here. In 2012, Habitat Services celebrated 25 years of service! To read a copy of Habitat’s 2012-13 annual report, click here. In 2010, Habitat Services led a community based research project entitled Breaking Ground: Peer Support for Congregate Living Settings which was funded by the Wellesley Institute (WI). 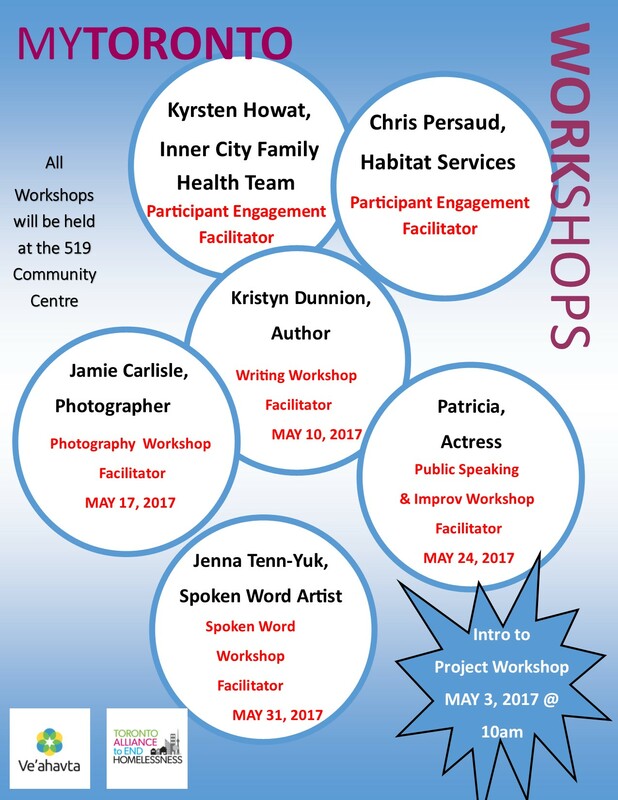 In partnership with the Ontario Council of Alternative Businesses (Now called Working for Change) as well as the Parkdale Activity-Recreation Centre (PARC), Habitat Services conducted community based research to consider the support needs of tenants and the employment of consumer/survivors/peers in a housing support role. The research included interviews with current and former Habitat tenants, Peer Support Workers at various agencies and agency representatives managing Peer Support Programs. The research findings were made available to the broader community and were used to prepare for the new housing model (Edmond Place) operated by PARC and funded by Habitat Services. Edmond Place opened its doors in January 2011 with a unique spin on the traditional boarding home model allowing tenants to have more flexibility and independence in their living arrangements. Edmond Place operates with a peer-staff driven model and offers employment opportunities to tenants living there. Habitat Services also provides monitoring services and housing support to the tenants at Edmond Place. To read Breaking Ground: Peer Support for Congregate Living Settings, click here to download the full report. In 2009, the Ontario Council of Alternative Businesses (Now called Working for Change) led a community based research project in partnership with Habitat Services and funded by the Wellesley Institute (WI). The aim of this project was to engage Habitat tenants, both as researchers and as participants in focus groups, to provide qualitative evidence regarding tenant employment. In addition to building the capacity of Habitat Services as an organization using qualitative research to promote recovery, this project also provided transferable skills to five tenants living in Habitat funded homes through training as research assistants. Through the facilitation of five focus groups, this project gathered feedback from approximately fifty individuals living in boarding homes on the topic of employment. The research found that while an overwhelming number of tenants want to work, they are confronted with a number of systemic and personal barriers. This report seeks to highlight the potential – realized and unrealized – of psychiatric survivors living in boarding homes as well as to inform the community development sector through engaging tenants in a grassroots, participatory manner. To read Not For Lack of Trying: Barriers to employment and the unrealized potential of psychiatric survivors living in boarding homes click here to download the full report. In 2008, Habitat Services undertook a Bed Bug Inspection, Response and Tenant Education Project in partnership with Woodgreen Community Services. Project staff included a Program Manager, 2 Tenant Education & Outreach Workers and 4 Peer Leaders. The staff completed in-house tenant bed bug education, bed bug inspections and follow-up to ensure preparation and treatment was completed properly by the home owners and operators. The project also provided education to Habitat Services staff and the staff working in the boarding homes. The final stage of the project was to document the program and disseminate the research findings as a resource to the broader rooming house sector, private and non-profit landlords, tenants and support services. The project steering committee hired Public Interest Strategy and Communications Inc. to undertake a broad research report that brought together local Toronto experiences and current worldwide knowledge and understanding of bed bugs. The result of this research was a report tilted: Bed Bugs Are Back: Are we ready? The ultimate goal of Bed Bugs Are Back: Are We Ready? is to inform and shape public policy, government responses and community strategies aimed at implementing effective bed bug interventions that prevent uncontrolled outbreaks. Woodgreen Community Services and Habitat Services also created a guide with assistance from Public Interest Strategy & Communications Inc. All about Bed Bugs: an Information Guide was written for tenants, landlords, community groups and anyone looking for simple and straightforward information about bed bugs. To read Bed Bugs Are Back: Are We Ready? click here to download the full report. To read All about Bed Bugs: an Information Guide click here.